You can download Lekin ( Urdu لیکن) by Jaun Eliya free in pdf format. 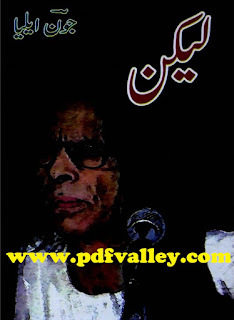 Jaun Elia was a Pakistani Urdu poet, philosopher, biographer, and scholar. He was the brother of Rais Amrohvi and Syed Muhammad Taqi, who were journalists and psychoanalysts. He was fluent in Urdu, Arabic, English, Persian, Sanskrit and Hebrew.